Shoplet has sent over some more office supplies for me to test out and review. 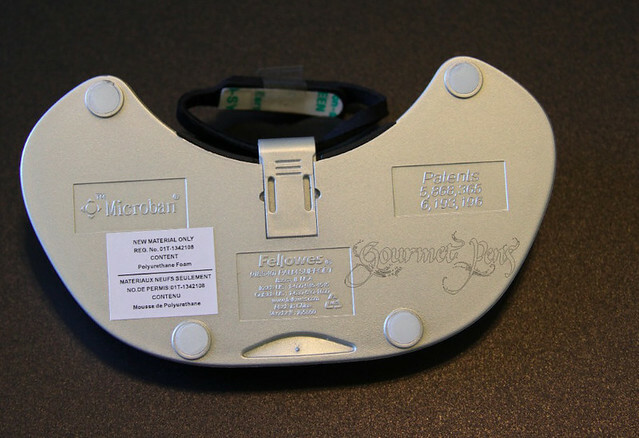 We received these two items in the mail: a Fellowes memory foam keyboard palm support, and a Fellowes memory foam gliding palm support with mouse pad. I have a habit in sitting in the worst positions and not paying attention to how I have positioned myself while typing and using the computer, so these come in very handy! Keyboard Pad - pretty simple. minimal packaging. Gliding Palm Support Wrist Rest - simple and minimal as well. Contoured shape encourages correct ergonomic position while placing hands in neutral posture. Patented Health-V™ Channel reduces wrist pressure to help prevent carpal tunnel syndrome. Microban antimicrobial protection helps keep the pad surface cleaner. 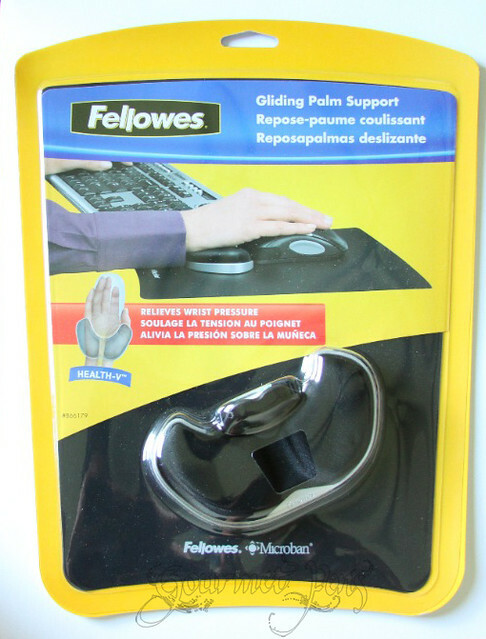 The Fellowes memory foam keyboard palm support is an all black, extended foam support (includes number pad). There are raised memory touch foam pads placed for both hands on the keyboard, as well as for the number pad on the end. The underside is rubbery to stick to your desk so it won't shift around. I was a computerized notetaker at the University of Manitoba for many years, typing in conditions that were not ergonomic, and at very high speeds for extended periods of time. The toll this took on my wrists became apparent when I couldn't even hold my toothbrush without searing pain. 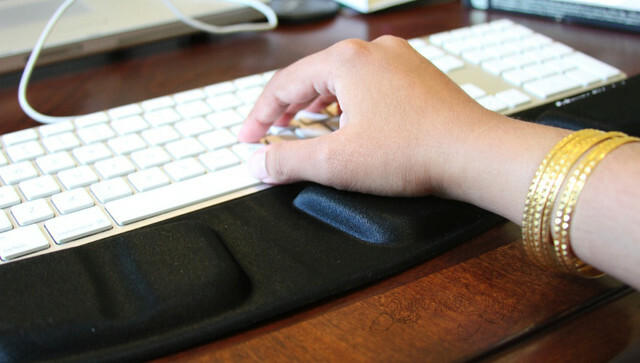 As a sufferer of repetitive strain injury in my wrists, I highly value support rests that can prevent the development of injuries or the exacerbation of old injuries. While you may feel silly using things like the Fellowes Memory Foam Keyboard Palm Support while you're typing, especially if you have no pain, bear in mind it was designed to prevent injury! As such, it should be taken seriously and I really think all computer users should have ergonomic rests, whether you use a computer a little bit or a lot. I think the grip on the bottom is great - it's not adhesive so it's easy to rearrange or move to a different computer should you wish, but it sticks really well. The black, shiny material of the support can get dirty very easily - by food or drink spills - so be careful. However, as a new item, it looks great. 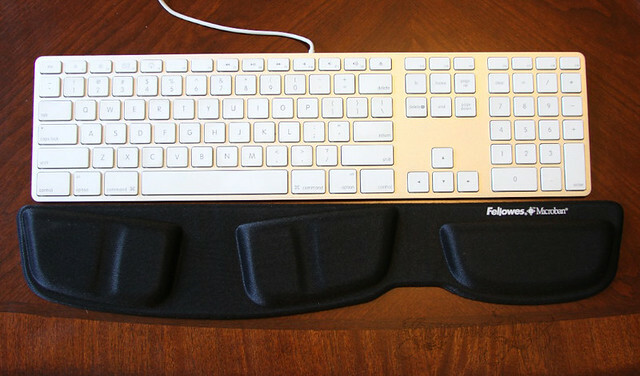 There are other keyboard pads that are a gel type material but those pick up so much lint and dust, and your skin sticks to them after resting on them, so I do prefer the Fellowes memory foam keyboard palm support to the alternatives, despite my concern for its surface. Because the bottom is grippy, it picks up a LOT of dust and fur (in my home), though it's easy to clean with a wet cloth. Given that it will probably not be moved around a lot, it will not affect the performance of the keyboard support! This is straight out of the package... it touched my desk once before I flipped it over... which means my desk needs cleaning. Compact, easy-gliding design encourages healthy, natural movement. 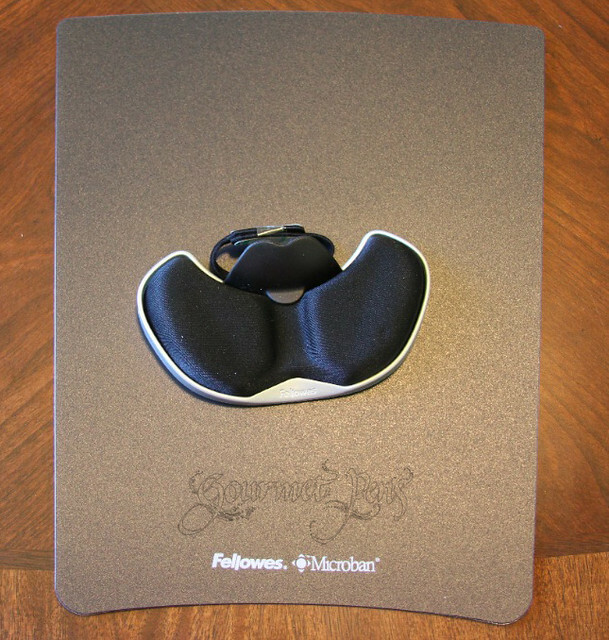 Microban antimicrobial protection helps keep glide and mouse pad surface clean. Self-adjusting support with expanded cushion puts any size hand in neutral posture. New flexible harness keeps Palm Support attached to your mouse. Updated Palm Guide keeps wrist correctly positioned. 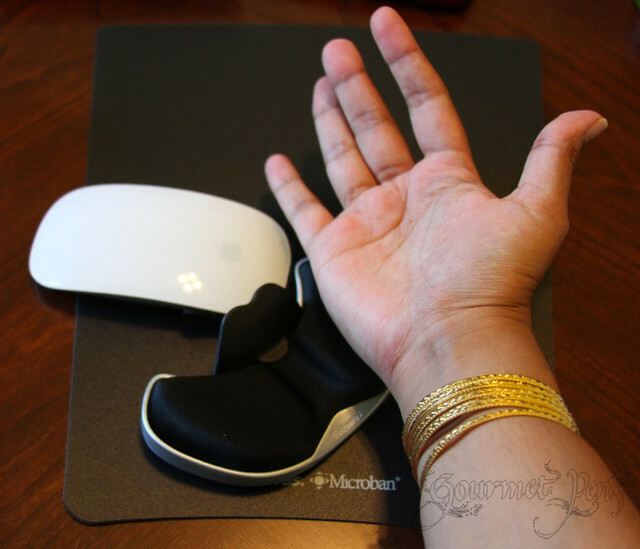 The Fellowes memory foam gliding palm support with mouse pad is a two part system. There is a flat, thin, plastic mouse pad with Microban. 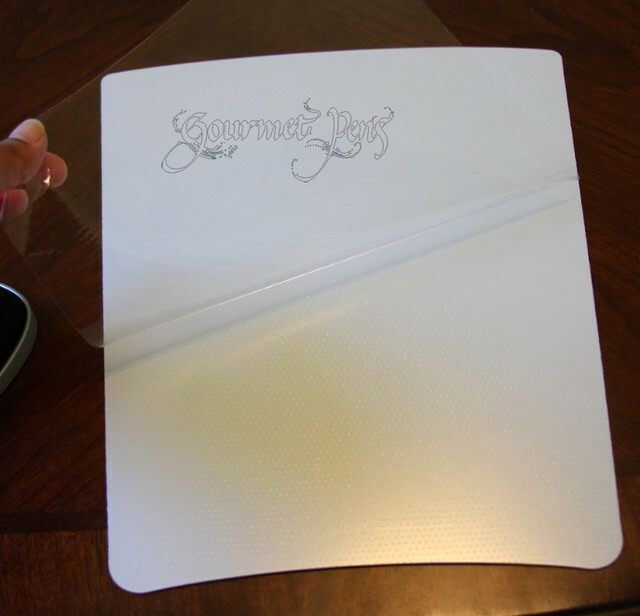 The underside of the mouse pad has a plastic sheet that you peel off to reveal many tiny little nubs that will grip to your desk so it won't slide around. The second part is the gliding palm support - essentially it is a memory touch foam pad sitting on a base (also with feet). 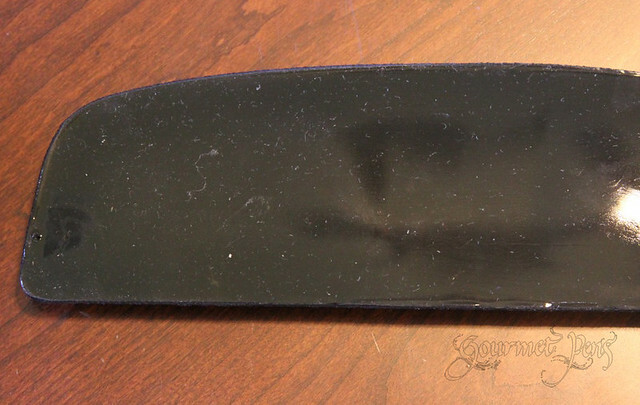 There is a black plastic palm guide, and two little neoprene straps with sticky ends that attach to your mouse to keep it aligned, while allowing for movement. I wasn't expecting the gliding palm to be so comfortable to use! As I mentioned, I suffer from repetitive strain injury, particularly in my right wrist, so I immediately could feel the difference in wrist positioning once I placed my hand on the palm support. It really does hold the wrist in the anatomically appropriate position to alleviate injury and pain. It's a great and simple design, although a little funny to look at. I use an Apple Magic Touch mouse so I don't know how necessary the mouse pad is, but it does complement the look of the palm support. The wrist pad is very comfortable to use. Palm curves rest on the support perfectly! When I think of how many things I touch then come and use my keyboard and mouse, I can only imagine what sort of bacteria grows on it, so I am pleased there is a Microban surface. It's easy to clean and makes me feel a little better about its cleanliness! Adhesive harnesses help keep the mouse in the guide area, though I don't think this is necessary. I don't care for the little harness for the mouse. I find it unnecessary because the palm guide only allows you to move your wrist a certain distance (assuming you are using it correctly). While the harness straps can be adjusted side to side, I wonder what will happen when I eventually need to replace my mouse. I'm not sure how well the adhesive will stick once it's been used repeatedly. I also wish the gliding palm support base would stick more to the mouse pad. For the most part, it stays just fine but if I move suddenly and it slides, I have to rearrange it to the position I like it. All computer users should practice good posture and ergonomic wrist positioning to prevent injury, especially if you are a computer user at work. Don't make the mistake of thinking "it won't happen to me" because it can! Both the Fellowes memory foam keyboard palm support and the Fellowes memory foam gliding palm support with mouse pad are a good price, and are good quality products. They certainly do the job and are fairly stylish! Aside from my minor concerns and dislikes, I still recommend both of these products. **I was provided one or more of these products for review, but all opinions are my own! I am suffering the same problems, due to typing habits. This gadgets are always useful and relieving.